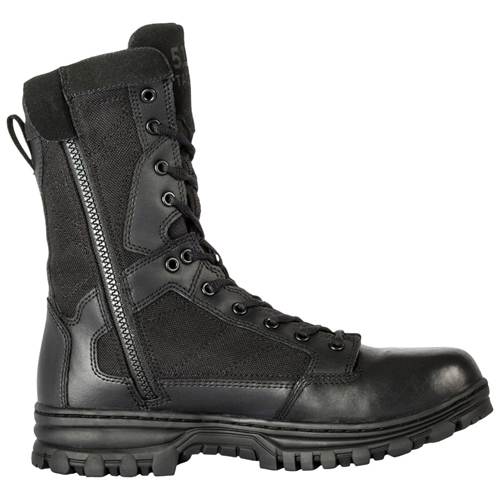 Full featured tactical boots with side zipper accessibility, Our EVO 8” Side Zip Boots are built for speed, stamina, and lightweight performance that won't slow you down. A 14mm heel to toe drop increases responsiveness and agility while allowing a more natural stance, and the innovative EVO Cupsole platform is cemented and stitched for enhanced durability. An authentic YKK side zip hardware ensures quick and smooth action, and non-metallic construction keeps weight down without sacrificing resilience. A full length EVA midsole, nylon shank, and genuine Ortholite insoles ensure confident footing over long distances. The oil resistant outsole prevents slips and squeaks, an embedded friend-finder tracking logo allows quick footprint ID, and extra thick sausage laces remain tight and secure when you're on the move.